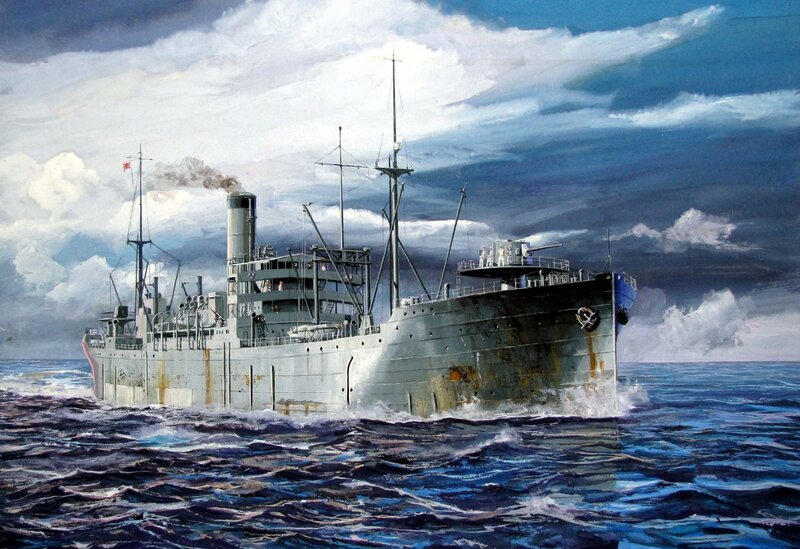 The Mamiya was completed on July 1924 and served as a food supply vessel of the Imperial Japanese Navy. The main purpose was to build an oil transporter. However, it was finally modified and fitted as food supply ship and became a part of the Combined Fleet. The ship was able to carrying enough supplies for 18,000 men (a full division of the IJA), which was enough for three weeks. It could also transport the necessary tools to produce food using kitchens. Among the foods produced by the ship installations it included youkan, manjuu, tofu and konyaku. She took part in the Pacific War operations as food supply vessel. IJN supply ship MAMIYA in 1930. Although she did not suffer any incident during the first years, on October 1942, she was hit by the submarine USS Cero but she could be repaired. Later, on May 1944, she was again torpedoed by the submarine Spearfish. Again, she could come back to service after repairs. Months later, she was hit by the submarine USS Sealion but miraculously survived again. On 21 December 1944, she was fatally torpedoed by the submarine USS Sealion and this time could not return port and was sunk. The second version is offered by Aoshima at the same scale 1/700. It is hard to recommend Aoshima version or Pit-Road version, so please choose by yourself based on your previous experiences with both manufacturers. I can say that I constructed the Pit-Road model and it is nicely done. But Aoshima quality must be very good too.